Today's been a fly by the seat of my pants kind of day. At 8:15 am, after the kids were safely sent away to school, I thought I'd better check the calendar, even though I was relatively certain I had nothing going on. I stood looking at my calendar, my hair greasy and badly in need of a shower, wearing my most grubby sweats, and realized that I had two meetings today... one that I'm hosting at my house... that I'd neglected to send out invites for. The other? Well, it was in 45 minutes. So, after sending out a few emails - with deepest apologies for such short notice, I sat considering skipping my 9 am meeting. And had pretty much decided that I would, when my husband convinced me that really? I should be there. It's amazing, you know, how quickly one can get ready when one needs to. Shower and all. The meeting was good. I'm glad I went. And now, I have a school assignment due. That I should be working on. And I will. But first, of course, I was poking around online for just a couple of minutes before I started and I saw Jane. And her Zebra Shiny T Tuesday. And I said to myself, "Hey! I'm wearing stripes. As unexciting as my clothes are? I'm wearing stripes. I think I'd better share that with the world. And while I'm at it... I'll post a full body shot... as painful as it is to me... because when I look at the picture all I see are those 20 extra pounds that are newly on my frame. But that's me, right now. And also? Stripes." So, this is how I looked sitting here at my computer, getting myself prepped to finish my assignment. Except for the boots. I added the boots to try to look cool. And really? I love those boots... they're the first ones I've every had that fit me really well. I know. SO exciting. But hey, a good pair of boots is hard to find. At least for us girls with big feet and ample calves. But, of course, I wasn't standing in front of my fireplace while I was on my computer, I was sitting at my desk in a completely different room. So I suppose I should say, "this is how I was dressed," which would be a better use of language, which I could have just changed without you all knowing my error. But what fun would that be? So, there you have it. A fly by the seat of my pants post for a fly by the seat of my pants kind of day. Jane's stripes are much more interesting... if you haven't been there yet, go over and check her and her beautiful pink hair out. Serendipitous stripes! You look pretty well pulled together for getting ready in a hurry. 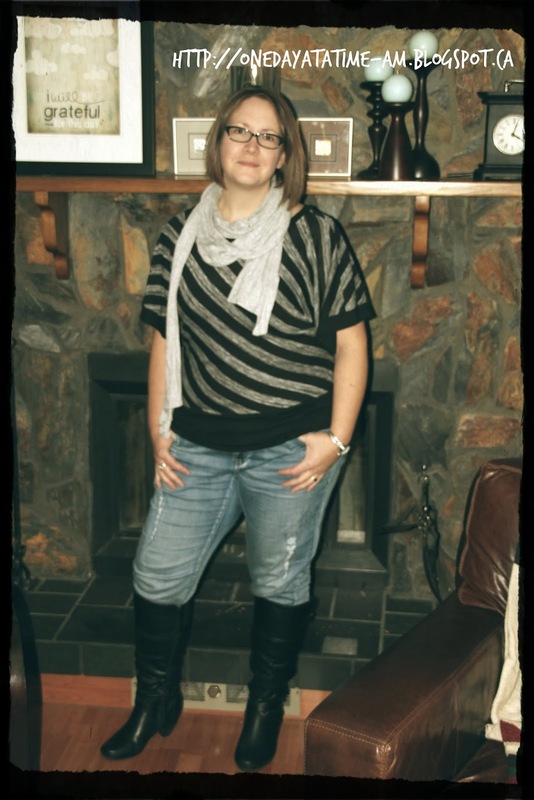 Scarf and boots are magic!